Doha, Qatar – September 18, 2018 – The rise of digital and social media combined with the polarization taking place in the United States has created a disrupted media landscape that analysts, journalists, and voters are struggling to understand. That according to Northwestern University Professor Pablo J. Boczkowski in discussing his new book Trump and the Media. 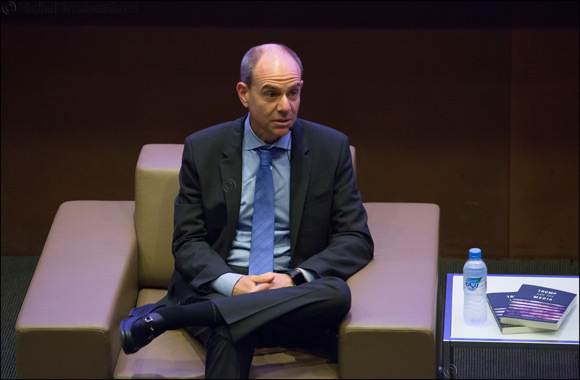 During his discussion, Boczkowski touched on several topics that included the changing perspective on journalism and the collapse of traditional news, emotional ties to current events and political behavior, how technology is influencing storytelling and political communication strategies, as well as future ways that news and social media could be used to improve the quality of democratic life. “The book tries to make sense of this evolution by looking at different aspects including the weakening of the press as an institution, the undermining of their financial and economic capabilities, and the polarization of societies over time – especially during the 2016 U.S. presidential elections,” he added. Among other topics, Boczkowski pointed to President Trump’s use of social, digital, and traditional media to gain more traction and coverage throughout his candidacy and presidency. And he also noted that President Trump’s attacks on the media have had bottom-line benefits for both him and the major media organizations in the United States. Boczkowski is a professor in the Department of Communication Studies at Northwestern University, co-director of the Center for the Study of Media and Society in Argentina, and will soon be senior research fellow at the Weizenbaum Institute for the Networked Society in Germany. His research examines the dynamics of digital culture from a comparative perspective, with a focus on politics. He earned his PhD and MA from Cornell University and was previously a faculty member at Massachusetts Institute of Technology before joining Northwestern.